Even though I am not very good at understanding any poetry more complex than, say, Tagore’s, when a book came out of John Paul II’s poetry shortly after his ascent to the Papacy, I grabbed it. Well, truth to tell, he was a rather avant garde poet, not the kind easily understood by anyone, however, one line reached me permanently. I take it that he means by simplicity here, naivete. And probably a young man of his consummate purity of soul and body would have been considered to be a naive simpleton. In my own experience as a philosophy professor and a speaker, I did find that when the horrible tragedies of life came upon me, as well as horror at things I was capable of, that my words took on a different tone – no longer beautiful sayings of Catholic truth, but hard won survival witnesses of hope coming only from grace. 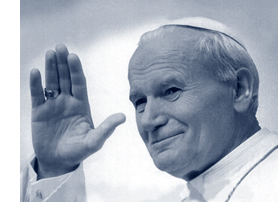 As we come closer to John Paul II’s canonization, let us never forget the price he paid for his truths.